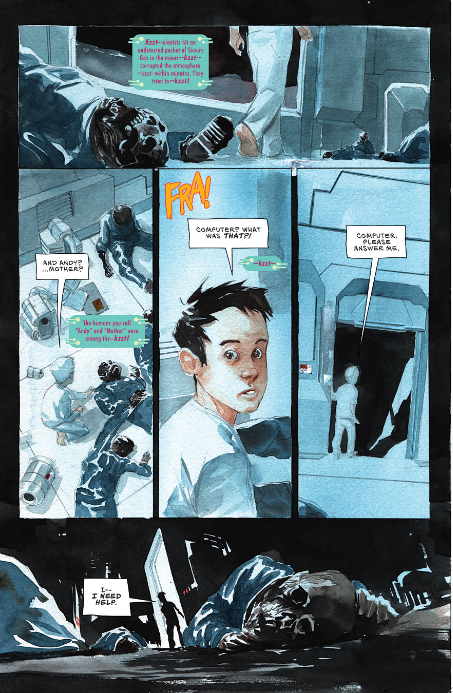 Hey everyone, I’m back with Descender by Image Comics, and I have to say this is an interesting comic. Everything about this comic – from the story telling, art, story line and so much more – is very unsettling. And that is what makes it such a good comic. The first thing I noticed that made the comic unsettling is the illustrations. 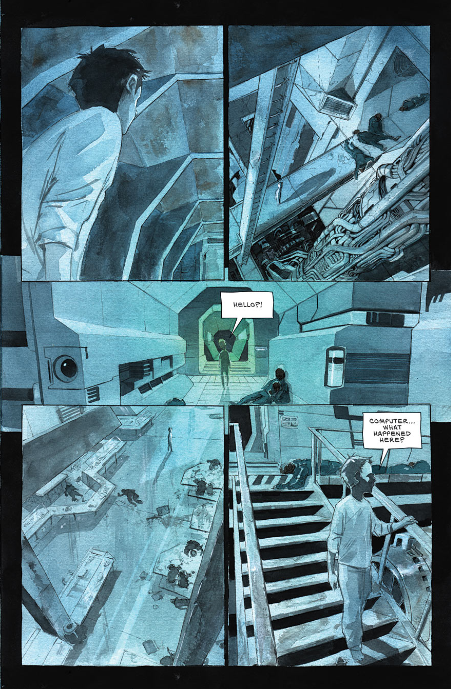 The comic isn’t drawn in a typical comic style, but instead looks like water colored paintings – giving it an unfocused, and thus, unsettling look. Next is how the readers come into the story. The story starts minutes before an unknown enemy attacks this intergalactic community. In these few minutes we meet one of our main characters, Dr. Jin Quon – a scientist with a specialty for robotics. And his robotics specialty is important, as the enemy is a robot. But before Dr. Quon can do anything, the enemy attacks and we jump to ten years later. We now find ourselves on a mining colony where everyone but a young boy – Tim 21 – has been killed by a gas. As Tim 21 looks around for his “mother’s” body, he learns that he has been “asleep” for ten years, and during that time people have been revolting against robots – blaming them for the enemy robots attack on their peaceful intergalactic community. This is not good news for Tim 21 – as I’m sure you have guessed why. Now, I will let you read what happens next, because there is something I want to get back to talking about – this comic being unsettling. As I said before, it’s unsettling to be thrown into a story starting with chaos. Also, having the unclear linens of the drawings is unsettling. But these are just tools to help cause the unsettling feeling the reader has about the story. And if you aren’t unsettled by this story, then you aren’t paying close enough attention. Now there have been plenty of stories about robots becoming smarter than mankind, revolting against their creators, and that’s unsettling in our technology driven world, but not what makes this story unsettling. No, there are two unsettling themes in this story, and our two main characters represent them. The first unsettling concept we get is with Dr. Quon – destruction of everything you know. Think about it – what would it be like to have your whole entire world – where you live, what you do, who you know – all destroyed in minutes? What’s it like to know you are about to be attacked and there is nothing you can do about it? Unsettled? The second unsettling concept we get is with Tim 21. He “wakes up” to find that he is the only “person” left “alive” in a world with dead bodies everywhere. What’s it like to have only your robotic dog and corpses for companions? Isn’t that’s what’s so scary about horror stories – people are killed off one by one till there is no one left to help the last person standing. Even Tim 21 says this as he walks through the corps covered hallways; he looks around and says he needs help. And just like the last person standing in a horror story – there is no one around to help Tim 21. And how would you feel if instead of Tim 21, it was you? This entry was posted in Comic Book Reviews, comic books, Dustin Nguyen, image comics, Jeff Lemire and tagged comic book reviews, comic books, dustin nguyen, image comics, Jeff Lemire. Bookmark the permalink.